The Non-Stop November program encourages chapters to participate in World Prematurity Awareness Month (for the March of Dimes) and American Enterprise Day. Participants are recognized at the State Leadership Conference and receive ribbons at the National Leadership Conference. In order to participate, chapters complete two required tasks and three out of eight optional tasks. 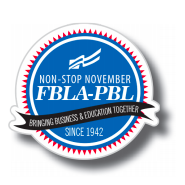 Entries must be submitted online at http://web.fbla-pbl.org/nonstop. The deadline to submit is December 10 at 5pm.